In spite of having been an English teacher I never used to like poetry. I think trying to get spotty thirteen year olds to appreciate Coleridge or Keats, ruined it for me (and probably for them). However in the last few years I admit I’ve been reading it for pleasure. 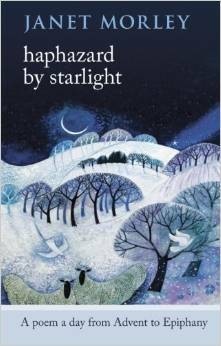 Thank you Alison Farnell, for giving me this book of poems for Advent, chosen and edited by Janet Morley. My reflections are not terribly original: I just think it’s great the way she portrays what Christians believe to be one of the most significant, momentous event in history in such every day terms. Time changed direction from counting down to counting up but no one noticed at that moment and even when they did notice that a ‘hinge’ event had happened they put the ‘hinge’ a few years adrift. The tone is all very everyday and dull, even peace and administrative tasks ‘counting heads’ seems tedious. The shepherds and the magi – ‘revered’ characters from the nativity, honoured by lavish artwork through the ages are reduced to ‘a few farm workers’ and ‘members of an obscure persian sect’ which is what they were. Had we met them we probably would have either been unimpressed or suspicious – they may have been wise men but they weren’t ‘kosher’, not even the hint of a solid Old Testament foundation – they were whacky stargazers! How did they get in on the act? That is the poet’s point. ‘Travelling foreigners with bizarre beliefs’ and ‘unclean low status’ individuals come ‘haphazard by starlight into the kingdom of heaven’. None of us come to faith by virtue of our own merit or worthiness, most of us come with a mixed up set of rather crazy beliefs, and few of us ever see angels or visions – starlight is enough, the event was enough. The ‘nothing’ that ‘happened’ must have been a ‘something’ because a ‘nothing’ cannot ‘happen’. If it happened it only appeared to be a nothing at the time, just another Jewish baby in remote place and the significance of that event is left for us to decide. Thanks for sharing this, Sheila. I’ve always enjoyed poetry, but for many years shied away from overtly “Christian” poetry for various reasons. However, I’ve been drawn into this far more over this past year, and I find Malcolm Guite’s material especially moving, thought-provoking & enjoyable. He blogs regularly, where you can find virtually all his poetry – especially his wonderful sonnets – along with audio files of readings and many music files inspired by his poetry. But, despite it being well on towards Epiphany, I shall also try to get a copy of Janet’s book as recommended above.